Throwing an unforgettable party doesn't require a ton of time or money; it just requires a little thought, creativity, and heart. The Occasional Affair gives readers the menus, timelines, shopping lists, planning aids, resources and encouragement they need to feel inspired and confident about throwing their own extraordinary gatherings. 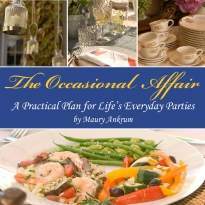 The Occasional Affair was written for the person who feels intimidated and apprehensive about throwing a party. Perhaps they don't feel they have the money, style, or resources to entertain - or maybe juggling myriad responsibilities makes them feel they don't have time to make the effort. Featuring more than a dozen exquisitely photographed parties that celebrate some of our most cherished holidays as well as unique and unexpected parties that can be the inspiration for birthdays, anniversaries - or just because. Approachable and realistic, The Occasional Affair includes all the details and resources to help readers plan, prepare and pull off beautiful, intimate gatherings - all on a mainstream budget. Maury Ankrum has been active in the entertainment industry for more than a decade, planning hundreds of parties, hosting dozens of charitable functions and organizing numerous corporate events. In The Occasional Affair she shares her creativity, techniques, secret sources and tips for transforming parties into truly memorable events. “I wanted to write a book to inspire people to look differently at the events and holidays that forever carve out our lives and memories,” Maury says. “I believe in miracles, I believe in second chances, and I believe that we each control our destiny and create our individual journey. I am a two-time survivor of cancer, and the mother of three incredible little girls given to me each with unique and complicated health issues. Through these experiences, I have a profound appreciation of how precious my time is with my loved ones and friends. Throughout our family’s journey, I’ve come to reorder my priorities and I’m determined to make my time count and to leave this world with enduring love and meaningful relationships. It is from this faith that I set out to make my moments into memories, and to encourage others to experience the profound joy that comes from making the effort to gather with friends and family. I wrote this book to inspire and help women everywhere to look differently at the events and holidays that are the basis for so many memories, to appreciate the power of creating these moments, and to recognize the opportunity to positively impact friends and family by enveloping them into these extraordinary moments." Ankrum lives in Denver, Colorado with her husband and three daughters. A portion of profits from her book will be donated to The American Cancer Society. Reflections of Christmas: Tiny footsteps and muffled whispers; the magic and nostalgia of Christmas is warmed with familiar faces and generous trays of hors d’oeuvres. Arctic Freeze: The temperature just dropped another 10 degrees, but inside on this cozy New Year's Eve the fire is crackling, the mugs are steaming, the desserts are delectable and the laughter is contagious. Send My Love: Intimate, secretive and seductive; celebrate the love story that started the day you and your partner met and continued through many houses, jobs, children and years. Reminisce with classic comfort food paired with fine wines. Easter Brunch: The eggs have all been accounted for, the chocolate bunnies have been carefully unwrapped and sampled, and the Easter dresses are no longer pristine white after a morning of exploration and delight. Let the crisp and seasonal brunch be a continuation of giggles and memories. Portrait of a Lady: It’s with unwavering grace and beauty that others see her… It’s with unconditional love and compassion that you know her. A Mother’s Day lunch honors the most important woman – or women – in your life. A Suitable Gentleman: He taught you how to live by showing you how. Celebrate your father’s unwavering love and devotion to his family with a plentiful and bold Father's Day coffee breakfast. Chasing Stars: Childhood memories of dancing fireflies, and nights spent watching for falling stars is the inspiration for friends and family to come together for an Independence Day celebration. Cinema Alfresco: “This is the beginning of a beautiful friendship,” and so it is… with an elegant picnic served with the setting sun, an outdoor movie shown under the stars, and classic snacks like popcorn and Juju bees. Tasting in Tuscany: The sun sets against the Tuscan sky as the table comes alive with a rustic Italian feast and grape-stopping escapade. This wine tasting dinner is sure to bring about a few laughs and memories. Formally Frightful: The moon laughs at the dark shadows, howling wind and distant cackling. Tonight let the unsettlings of Halloween be explored over the heartier flavors of autumn. A Grateful Thanksgiving: The snow may be blowing outside, but inside the fire warms our hands and hearts, the smell of hot cinnamon rolls and a homemade breakfast are just a few of basic of gifts on a day dedicated to gratitude and appreciation.